My Nose Turns Red offers year-round, on-going circus classes, spring break and summer circus camps. For more detailed information click here. My Nose Turns Red conducts weekly after-school circus classes in the Greater Cincinnati Area. 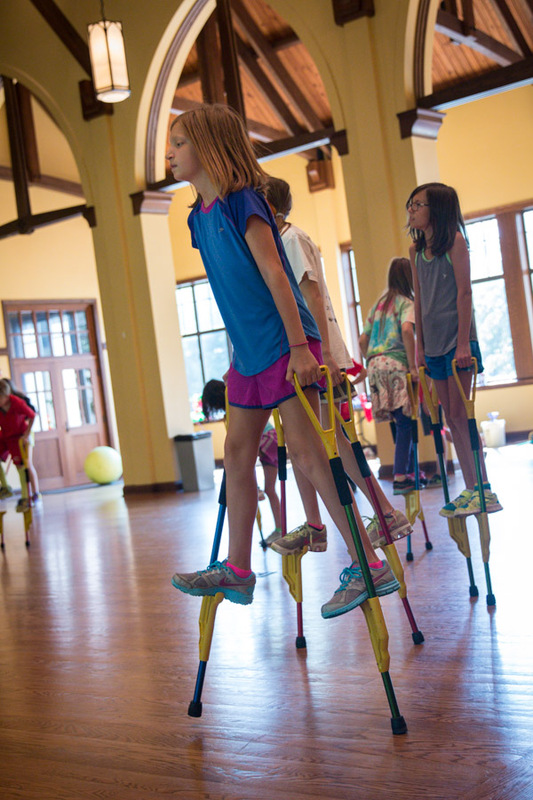 After-school classes are led by director Steve Roenker and circus teen apprentices for 6-12 weeks. Contact My Nose Turns Red to discuss having an after-school circus program at your school. Performances are excellent for libraries, festivals, neighborhood gatherings and community engagement events for all ages. Youth Circus Performance – Members of My Nose Turns Red’s Advanced Circus Ensemble perform amazing feats and physical skills such as gym wheel, unicycle, acrobatics, hoop dancing and clowning. Shootang and Friends – Theatrical Clown Shootang performs classic comic routines, balance, and mime. Shootang and members of My Nose Turns Red’s Advanced Circus Ensemble, perform amazing feats such as gym wheel, unicycle, acrobatics, hoop dancing and more. Both performances can be followed up with a workshop where participants can balance on the rolling globe, hoop, learn to juggle and rock in the gym wheel. 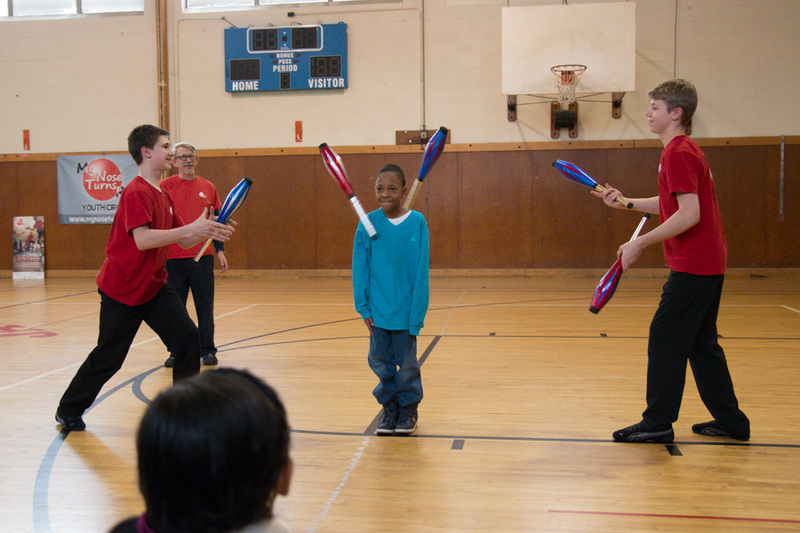 In-school performances, residencies, or workshops are tailored for grades K-12. 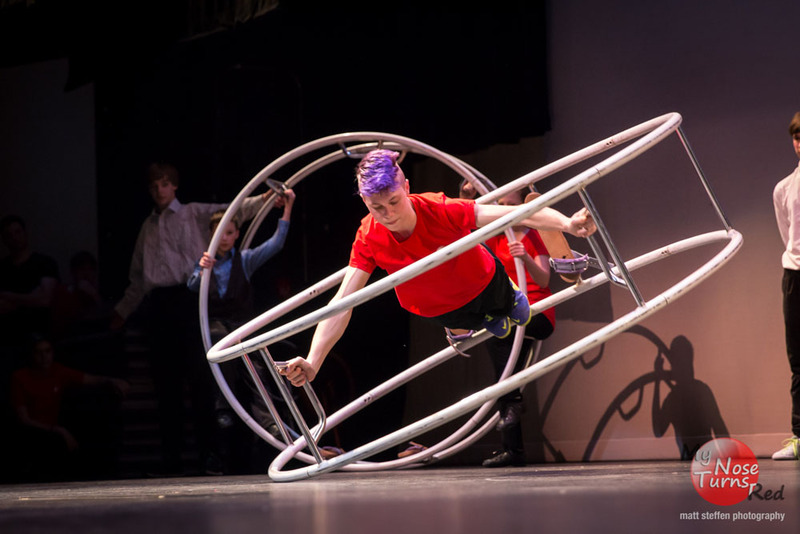 Circus in the Schools – Bring director Steve Roenker and several of our amazing youth circus coaches/performers to your schools for a demonstration of circus skills such as gym wheel, unicycle, tightwire, acrobatics, hoop dancing and more. Performers will share their creative process, skill development and take questions from the students. My Nose Turns Red Youth Circus offers a variety of workshops in physical comedy for theatre companies, youth circus performers, schools, and educators. Workshops can be arranged following a My Nose Turns Red performance or as a standalone training in circus skills, clown character development, physical comedy or juggling. Let your students run away and join the circus – without leaving school! Residencies provide an in-depth experience for participants. All circus residencies begin with a performance by My Nose Turns Red, followed by workshops and conclude with a circus performance by participants for their school and community. 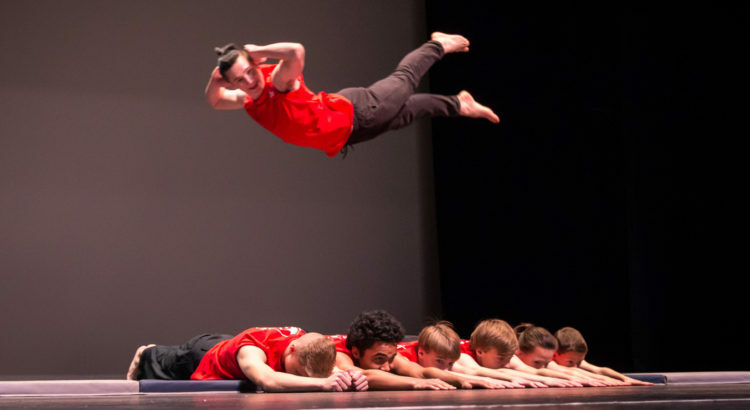 Performances, workshops and residencies follow the Kentucky Academic Standards for the Arts and Physical Education. Students will learn balance, stilt walking, juggling, wire walking, hooping, rolling globe and more. Increase your student’s physical literacy skills while immersing them in a theatrical experience. For high school and college students with a strong interest in theatre and physical comedy, begin with a Commedia lecture-demonstration covering the masked Commedia dell’Arte characters and their lazzi (comic turns). This highly engaging residency explores how the stock characters moved and interacted with each other and can be used as a developmental workshop for your project or a culminating scenario.